While working in a large Animal Shelter, I had contact with thousands of opossums! Most had been hit by cars, attacked and injured by dogs or captured in traps by residents and picked up by our Animal Control Officers. Thank goodness, a few years ago the County stopped accepting trapped wildlife so, people had to learn to live peacefully with Opossums. 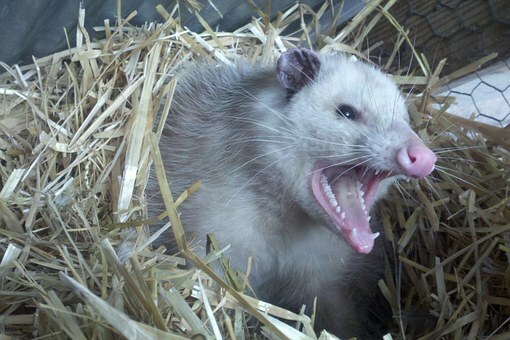 Many people feel that Opossums are aggressive because of their big mouths and 50 sharp teeth! In fact, Opossums are solitary, gentle and placid creatures. Adults are normally very slow moving and will only open their mouth to show their teeth and hiss when fearful. They don’t initiate aggression. They will retreat whenever possible. Opossums are actually quite beneficial to our areas. They are omnivores, so that they eat both meat and vegetation. They are essentially scavengers, cleaning up the rotten fruit and debris in our lawns, in addition to carrion (dead road kill, etc.) They will eat insects, snails, slugs, worms, berries, nuts, grass, leaves and pet food. They are very flexible and make due with whatever food and water is available. Pretty much every yard has Opossums walking around at night. Trust me, they’re not a threat to you or your pets. Adult Opossums are about the size of an adult cat. Their body is @ 13″ to 20″ long. The tail can be 9″ to 21″ long. They use their thick, prehensile tail to scale and sometimes to carry leaves, etc.. Opossums can live in trees however, the adults can’t hang by their tails while they sleep. Opossums will make a den in any dark, quiet place. They do not put much effort into making a home. Opossums are North America’s only marsupial mammal (female that has a pouch for carrying her young). They are also nocturnal (sleep during the day and active at night). The Opossum’s breeding season is from February to June. They become adults and start mating at @ 1 year old. They can have 1 – 2 litters per season, depending upon the climate. The gestation (time from conception to birth) is just 12 – 14 days. The mother has 13 teats and that’s the maximum number of infants she can nurse. Usually, 13 babies will not make it in the pouch and of those that do, only about 3 to 6 will make it to weaning age. The infants are born undeveloped embryos. As soon as they are born, they scoot to the mothers pouch where they latch onto a teat. After the babies latch on, the teat swells and elongates and they stay there constantly. The infants are weaned at 2-3 months old and are considered juveniles. At this time they are 6″ to 7″ long. They become independent of their mother when they are 6 – 12 months old and about 7″ to 10″ long. They become mating adults when they’re @ 1 year old. The adult males are larger than the females. Opossums only live 2 – 4 decades. They’ve a lot of predators! Between humans, cars, dogs, cats, owls and bigger wildlife, Opossums do not survive very long.